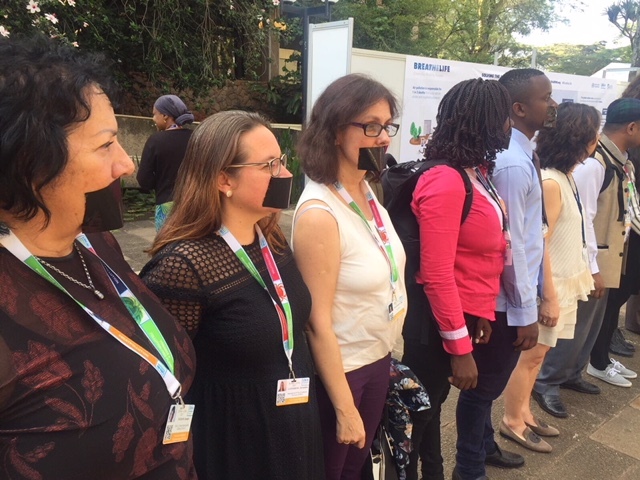 At the recent 3rd meeting of the United Nations Environment Assembly (UNEA3) HEJSupport International participated in a silent action organized by the Women’s Major Group and other CSOs. The action was held in the memory of all women environmental defenders who were killed during last years while protecting their land and people from illicit invasion of industrial corporations. At UNEA3 HEJSupport International had a meeting with Mr. John Knox, UN Special Rapporteur on human rights and the environment. The meeting provided us with an opportunity to highlight our concerns related to how CSOs were treated at UNEA3 as well as nationally and internationally. A draft policy paper prepared by UNEP was shared with the meeting participants. The aim of the paper is to promote greater protection for individuals and groups who are defending their environmental rights and identify solutions to mitigate the abuse of environmental rights which affects a growing number of people in many parts of the world”. UNEP is planning to set up an email account defenders@unenvironment.org to enable communities and individuals whose environmental rights have been violated – or are in danger of being violated – to contact UNEP directly and in confidence.